Travis D. Smith is associate professor of political science at Concordia University in Montreal, Canada. He earned his doctorate at Harvard University in 2005 with a prize-winning dissertation on the political significance of the philosophical origins of modern technological science. His scholarly publications focus on the thought of Thomas Hobbes and Francis Bacon. He has contributed to the popular press in venues like The Weekly Standard, Entrepreneur, and Convivium. His other publications, on liberal education and on the relationship between politics and literature, include Superhero Ethics (Templeton, 2018). In the classroom and in my writing, I strive to take ideas and arguments that are complex and unfashionable and make them accessible and relevant. This often involves drawing on examples from popular culture for purposes of explanation and illustration. 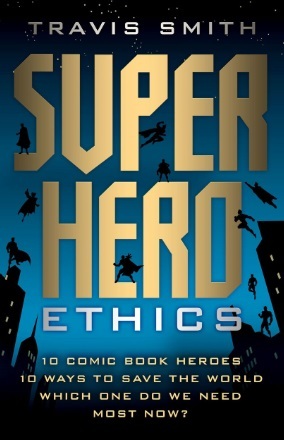 Superhero Ethics is an exercise in that, in long-form. To my students I emphasize that persuasion requires showing respect to people with whom one disagrees, appreciating where they’re coming from, and not merely insisting loudly on one’s own convictions. We should prefer persuasion to compulsion in advancing our positions. When I draw on current political debates and events, I want to give every perspective a generous reading. Only then can we compose compelling criticisms. My students are not expected to share my own views; in fact, I warn them that I’m inclined to expect more from people who agree with me. I like considering offbeat angles and trying out unlikely ideas, even on the fly; exercising some dexterity in figuring out whether they might pan out is preferable to always playing it safe and sure and strictly heeding a prefabricated script. Students deserve more than instruction in orthodox opinions or bullet points projected on screens. Being a good husband, father, and teacher are my principal commitments—where being a teacher is inseparable from being a learner. As a teacher, my highest calling is to moderate students’ excesses and deficiencies. Those successes can only come one student at a time, but they’re the kind that matter. With students who are shy, introverted, or anxious, I work to build confidence. And trust me, I get being introverted and anxious. But we fail our students if we don’t teach them that they’re capable of gaining confidence. In my field that means learning to speak intelligently about political opinions, with reasons and arguments. That’s very intimidating until you get some experience doing it—unless you’re naturally gregarious or obnoxious. Likewise, bright students don’t need to be praised; they need to be challenged. They need to see that they’ve been overrewarded already and they could do much better than whatever they’re used to doing for the sake of getting good enough grades. And when I encounter an angry student, my responsibility is to teach mildness. Some professors will stoke that anger and turn it into righteous indignation and outrage. That’s poison; an irresponsible, monstrous thing to do to a young person. Completing Superhero Ethics has been a huge milestone. It took a lot of rewriting as I developed new communication skills. I received a lot of editorial assistance, learning to “exterminate my darlings.” But graduating from Harvard with a Ph.D., just a regular kid from a regular family with parents who held regular jobs, finding myself a green fish out of water in the Ivy League, studying political philosophy with the best teachers in the world, only three years after leaving behind a potential career in engineering—I’m proudest of that. I realize how fortunate I am to have had a middle-class twentieth-century childhood in southern Ontario. That’s practically hitting the jackpot from the perspective of human history. But nothing about it prepared me for Harvard. Both of these accomplishments were made while dealing with a chronic pain problem on a daily basis, too, refusing to let myself be defeated or defined by a condition that is literally “only in my head,” but no less real for that. Anyone who is struggling to achieve their goals in life while battling chronic pain knows what I’m talking about. Transferring into political science and philosophy, out of a degree program in engineering, where I was already excelling—that was the most impactful decision I have made, the biggest “either/or” moment in my life. Fortunately, I had family and friends who supported me through that transition. I took a big risk, but I followed my heart. How romantic! My wife tells me my motto is: “Oh my God I have so much to do and everything takes longer than I think it should!”—best run together as one long word with no hyphens or spaces in it. As someone who learned to overcome perfectionist tendencies and a lot of self-doubt, though, the main advice I relay to my students is: “Have confidence in your competence.” I’ll go with that. The premise of Superhero Ethics is, “Which superhero is the most admirable and worthy of emulation?” Of course, the correct answer to that question is: “My wife.” My son is right up there among my favorite people. Most influential were the people who voluntarily took on mentoring roles for me as I was growing up. Marg and Dale Simpson, neighbors who were professional educators, I cannot thank enough for their many patient conversations, teaching me what friendship means. In college, Professors Sam and Janet Ajzenstat gave me my first glimpse of what it means to live the life of the mind in a fashion that is consistent with being a good citizen. In my book I thank my parents, too, for “storing my comic book collection in their basement for many years”—a bit of irony given how impossible it would be to express my gratitude sufficiently. Among celebrities, people I’ve never met, I probably admire Tori Amos and Norm Macdonald most, for placing integrity over commercialism in their art and for emphasizing a combination of craft and originality, mixing the forward-looking with the backward-looking in order to pursue excellence in doing their own thing. Since I wrote a book on superheroes I might as well mention Brian Michael Bendis, too, who in addition to his many superhero stories also wrote a lot of essays in letter columns and on the Internet about writing what you want to write, not what you think other people want you to write, from which I gained some encouragement. I don’t like the outdoors because that’s where nature is. I’m not much a traveler, either. I do enjoy going to Yankee Stadium or Fenway Park to see a kind of excellence on display. My wife and I had seats in the bleachers when David Cone pitched his perfect game, so it’s probable that nothing will top that as a spectator. I wish I could go to nineteenth-century Russia and have a conversation with Leo Tolstoy though, or seventeenth-century England to play tennis with Thomas Hobbes. I live in my head more than in the physical world. I don’t appreciate luxury items. I don’t understand sports cars or fancy wristwatches. I have books though, many of which I plan to read someday. My wife and I do some songwriting together. I’m also hoping to train to referee some professional wrestling matches soon, even if only small-time—at county fairs and the like. As a professor of political philosophy, I already have a lot of experience pretending that things I am sure are not true might be true.